Simple Chalkboard ideas Simple DIY chalkboard ideas made from common items found throughout the home. When I was recapping my favorite posts of 2015, I noticed in my photos that I had a number of projects that involved creating a chalkboard from common items. This sparked the idea of combining those ideas all in one place for future reference for myself and others looking for Simple Chalkboard Ideas. The beginnings of my blogging days began with showcasing how I used my thrifty finds for decorating. It was in one of those posts that I noticed I displayed a chalkboard I created but never gave mention. It was strictly used as a staging prop. In this post I was sharing how I created my home office using a found thrifty cabinet. But displayed right on top of the cabinet was a cutting board in the shape of a pig painted with chalkboard paint. This was my first chalkboard project. I just loved how it turned out and how it provided a super easy and fun way to write messages or make lists. Functional and cute. The next chalkboard attempt turned out to be the easiest and most pleasing end result project. 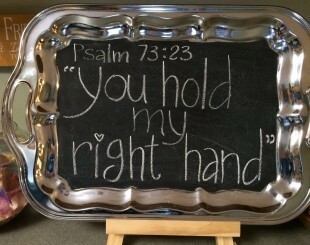 It was a spur of the moment birthday gift I completed, a DIY silver chalkboard tray. For complete instructions, please click on the link. It is a project that can be completed in less than an hour and special enough to give as a gift. The fun thing about sprayable chalkboard paint is that it can almost create anything into a chalkboard. In this project, I sprayed the glass of a picture frame with chalkboard paint. Tah, Dah!, instant hangable sign that can be changed out as often as needed. 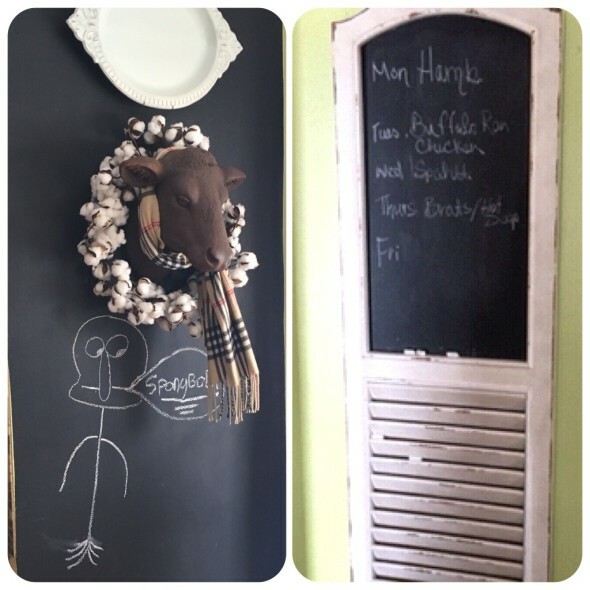 I currently have created some fun chalkboards that I use in my home. The first was a small wall off my kitchen area next to my desk that I thought would be perfect for a large planning area. It took quite a few coats of paint for an even coverage. Possibly priming the wall first may have helped. However, as you can see it works just fine. It has turned into a drawing easel for my son. I smile every time I look at it, so I just go along with its new purpose for now. There will be a time in life that I will long for little surprises of such. My shutter chalkboard probably gets the most use. I currently use it as my meal planning board. Here too, the kids have put there touches on it from time to time. I often find a meal request posted or a critique of a meal. It certainly catches me off guard but always makes a happy heart. I think I have discovered I love chalkboards. It is so much fun to think outside of the box and create something fun and whimsical. How do you use chalkboards throughout your life happenings? Have you created any? Please share. I have made several chalk boards with pictures and baking sheets. 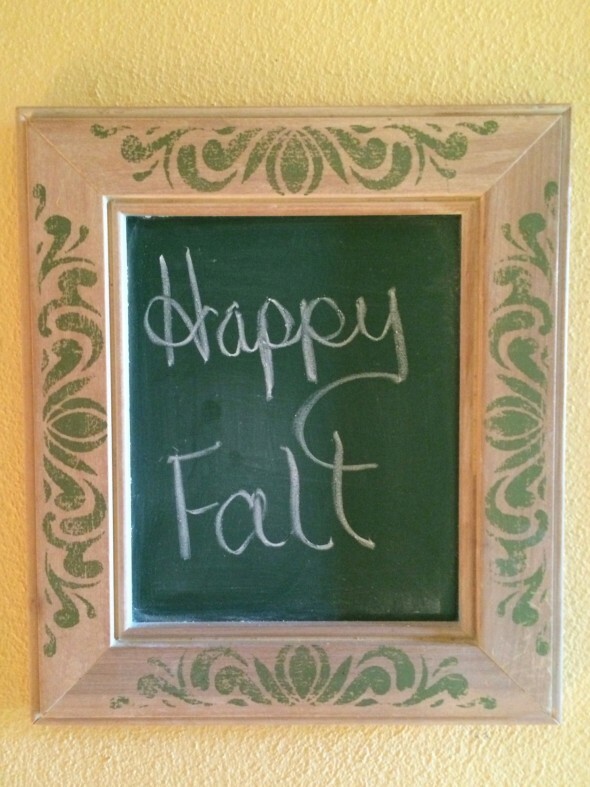 I struggled with getting the chalk paint to allow for easy chalk writing after it dried. Your silver tray is gorgeous. So glad you shared with us at Merry Monday. A few months back I painted a narrow wall with black chalkboard paint and added a foam molding to make it look like there is a frame there. No one can guess that it is actually painted on the wall. I love it so much, best thing I ever did!! That’s a great idea, Mary. How do you use it? I love these chalkboard ideas! The frame with the stencil in is really pretty. I love the pig cutting board. I remember some of these posts. The silver tray and cutting board ideas are my favorites. I really love chalkboards and chalkboard art. The pig-shaped cutting board turned chalkboard is my favorite. I like them all! The silver platter is great, too! I have a couple of silver trays set aside for turning into chalkboards, myself! My mom made two last week with old cookie sheets! LOVE! Oh … Cookie sheets. Great idea. Thanks Kristen. Share the Picts when you are finished!